Landfills are a finite resource; by using them resourcefully, we assure that they will be an economical resource long term. According to the Energy Information Administration a paper mill that uses recycled paper consumes 40 percent less energy than it would by creating paper from fresh lumber. 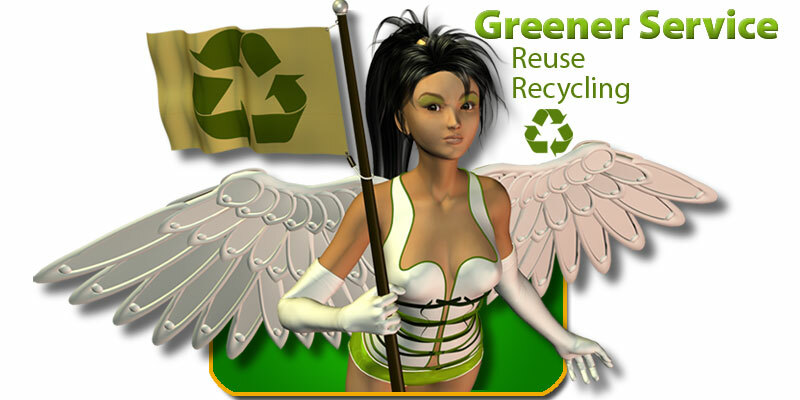 Work dedicated to recycling creates better working conditions. For example, the labor conditions of harvesting timber and ore are far more dangerous than the recycling of paper and metal. Recycled paper and cardboard products preserves virgin forests. Virgin forests have bigger trees that are able to fix their soil more quickly than farmed forests that suffer soil erosion requiring large amounts of fertilizer. Computers and electronics contain reusable tin, silicon, iron, aluminum and a variety of plastics as well as containing copper and gold that is valuable enough to reclaim its own weight. Composting is created creates useful material out of kitchen, garden and other green waste. Composting is a process that allows natural aerobic bacteria to break down the waste into useful topsoil. Greenpeace views recycled timber as the most preferable timber source. New batteries are now produced using 80% recycled material because lead-acid batteries, such as those found in automobiles, are relatively easy to recycle. Concrete aggregate can be put through a crushing machine, along with asphalt, bricks, dirt, and rocks. From there, smaller pieces can be used as gravel for new construction projects. When recovered in bulk, plastic can be recycled more efficiently by sorting items into their resin identification code where they can see reuse. Textiles can be donated to fiber reclamation mills where they are then sorted according to fiber type and color. The textile are then shredded and blended into other selected textiles where they can be reused. Glass that has been sorted into correct color categories can be crushed and blown into new jars and bottles. Furthermore glass can be recycled indefinitely because its structure does not deteriorate when it gets reprocessed. Aluminum recycles very efficiently saving 95% of the cost of producing new aluminum.